"At Zoom, we engineer happiness into our product suite. We hear time and again from happy customers that Zoom 'Just works,' but we don't stop there. We innovate beyond quality and reliability to create a truly unique and comprehensive communications solution. Zoom Voice, our App Marketplace, and the ongoing enhancements we make to Zoom Rooms and our core video meeting platform demonstrate our commitment to innovation and customer happiness," said Oded Gal, head of product management for Zoom. Zoom Voice is a cloud phone system that will be available as an add-on to Zoom's video communications suite. Support for inbound and outbound calling through the public switched telephone network (PSTN) and seamlessly integrated traditional telephony features will enable customers to replace their existing PBX solution and consolidate all of their business communication and collaboration requirements into their favorite video service. Zoom Voice will be generally available for North American customers in the first quarter of 2019 with support for localized telephony services in 16 countries. The service will roll out globally over 2019. App MarketplaceZoom's rich set of APIs and cross-platform SDKs power more than 100 million API engagements per month. Now, Zoom's App Marketplace brings together these integrations built by Zoom and third-party developers, making it easy for customers and developers to extend Zoom's product portfolio with new functionalities. The marketplace includes a multitude of categories including Assistants, Productivity, Scheduling, and Unified Log-In. Apps in Zoom's marketplace are fully vetted by Zoom for security and user experience. The marketplace features apps and bots from companies such as Clara Labs, Egnyte, HubSpot, Hugo, Microsoft Teams, Otter.ai, Slack, and Theta Lake. "We are proud to be among the first apps available on the Zoom App Marketplace. Building integrations across best-of-breed solutions and making them easily available for customers in app marketplaces is the future of cloud services. It is the best experience for our customers - including IT, compliance, and their end users - and that is what really matters," said Devin Redmond, CEO & co-founder of Theta Lake. Hardware Device Partnerships:AVer, Crestron, Dell, DTEN, Logitech, Polycom, and Suirui have co-developed with Zoom devices that feature deep Zoom Rooms integrations, making it easier for customers to deploy and manage their Zoom Rooms hardware by reducing the number of components needed. These devices will be available in kits, all-in-one devices, or individual components through several distributors such as Ingram Micro Inc., Starin, and Tech Data - Maverick AV Solutions; resellers CDW, Think Fast Track, and VideoConferenceGear.com; or the hardware providers themselves. Availability varies by provider, some of whom are taking orders in the Zoomtopia expo hall. -- Zoom Rooms Multi-Share:Multiple users in a Zoom Room can now simultaneously share content on displays, making for a richer, more seamless collaboration experience. On the Zoom Rooms Controller, users can manage how the content is distributed across the room's displays. Now available. -- Zoom Audio Processing:Zoom is moving audio processing from hardware devices to its Zoom Rooms software, providing the ability for iterative audio enhancements through machine learning. With Zoom Audio Processing, each microphone's audio stream is received individually and mixed in real-time, enhancing the active speaker's audio with echo cancellation and noise suppression. This capability is available on select microphones today, and will be expanded to support microphone arrays on hardware devices from providers such as Aver, DTEN, and Suirui. 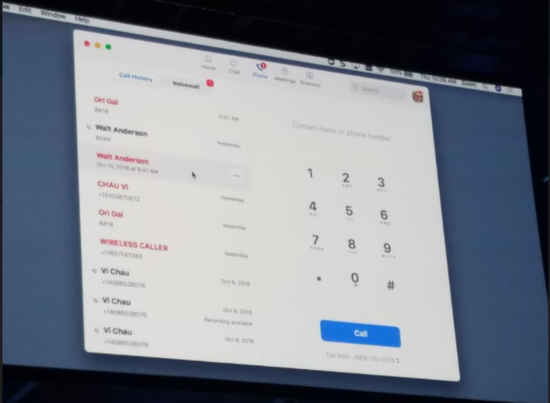 -- Enterprise Management:Available now, Zoom has released enhancements that will help IT managers better mass deploy, troubleshoot, and proactively monitor their Zoom Rooms. The release includes remote Zoom Rooms rebooting, automatic optimization of Mac and Windows OS settings during installation, Windows MSI installer for mass deployment on Windows, and OAuth support for Office 365 calendar integration. -- Zoom Rooms Meeting Start on Mobile:With proximity detection, users will be able to start a Zoom Rooms meeting by clicking a button on their Zoom mobile app. This is the perfect solution for hosting ad-hoc meetings from your conference room. Mobile support will release by the end of 2018, desktop support during 2019. -- Digital Signage Enhancements:Digital Signage administrators now have more control over how they deliver content, with the ability to schedule content in advance and upload video files directly to their content library (supports .mp4, .wmv, .avi, and .mov files). Increase Default (Basic/Free and Above) Capacity to 200 Video Participants:Accounts currently using Large Meeting 200 will be automatically upgraded to Large Meeting 500 at no additional cost. Available by the end of 2018. -- Virtual Backgrounds:Zoom is improving its virtual backgrounds to work without a green screen. Available now on iPhone 8 or later and available on desktop by the end of 2018. -- Audio Signature:When enabled, this security feature embeds each VoIP user's credentials/identity into their unique audio track. If a participant leaks the audio from your meeting, it can be traced back to them. Available by the end of 2018. -- Headset Controls: Users can control their Zoom meetings via their headset - including join, leave, mute, unmute, and volume. Now available for some Jabra and Plantronics headset models; more models and providers to follow. \"At Zoom, we engineer happiness into our product suite. We hear time and again from happy customers that Zoom 'Just works,' but we don't stop there. We innovate beyond quality and reliability to create a truly unique and comprehensive communications solution. Zoom Voice, our App Marketplace, and the ongoing enhancements we make to Zoom Rooms and our core video meeting platform demonstrate our commitment to innovation and customer happiness,\" said Oded Gal, head of product management for Zoom. \"We are proud to be among the first apps available on the Zoom App Marketplace. Building integrations across best-of-breed solutions and making them easily available for customers in app marketplaces is the future of cloud services. It is the best experience for our customers - including IT, compliance, and their end users - and that is what really matters,\" said Devin Redmond, CEO & co-founder of Theta Lake.